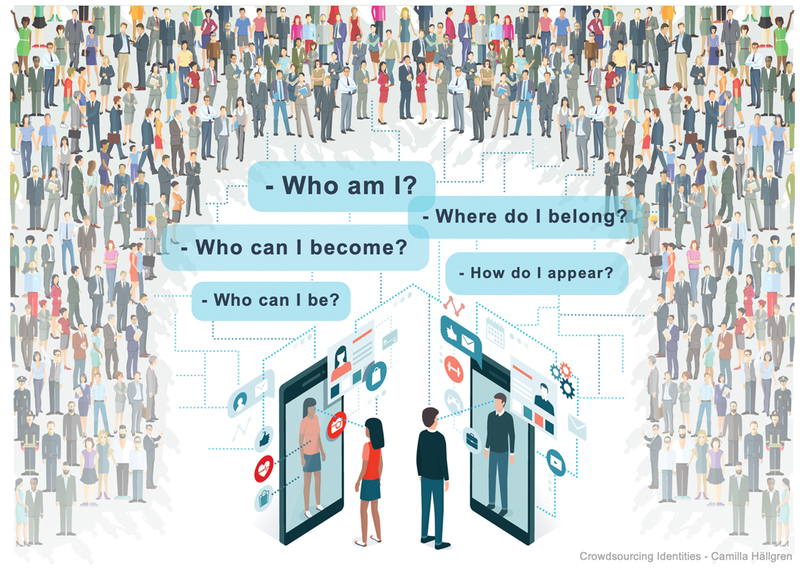 Crowdsourcing Identities is suggested as one interpretive lens – as one way for thinking about – humans’ practice of making identity in conditions mediated by contemporary digital technologies. It converges perspectives of existentialism, social constructivism, technology and ideas of crowdsourcing. By combining perspectives of existentialism and social constructivism the making identity is thought of as a relational practice, essential to exist as someone, rather than as no one. Furthermore, I consider the making of identity as human’s continuous requests and answers about being, becoming and belonging. That is; Who am I? How do I appear to others? Who can I be and become? And, where do I belong? Although, contemporary digital technologies are not essential to make identity, they can offer conditions where, for instance, social interactions about existential matters, such as identity, can be mediated and reified in ways that were not possible in pre-digital times. Social media, for instance, can offer extended ways to represent and communicate identities, and also offer ways to interact with others and gather information. In multimodal, multidirectional, collaborative and networked ways humans can turn to online crowds of others, ask for feedback, explicit or implicit, and engage in continuous requests and answers about being, becoming and belonging. Who am I? How do I appear to others? Who can I be and become? And, where do I belong? This, I suggest, is a form of crowdsourcing that concerns existential matters of making identity: a crowdsourcing for identity. Further reading: Hällgren, C. (2019) Crowdsourcing identities: On identity as an existential practice mediated by contemporary digital technology First Monday, Vol. 24, No. 1.